Vending machines haven’t received a technological revamp in quite a while. We’ve seen interesting mods that require you either tackle, hug, or tweet to get a drink dispensed, but none of those integrations were revised from the root of the hardware. Intel is changing this up by introducing a next-generation of vending machines that will come with Intel Core i7 processors — making those tall machines typically found in gyms, school cafeterias, and airports run on the same chips that are supporting your average PC laptop. 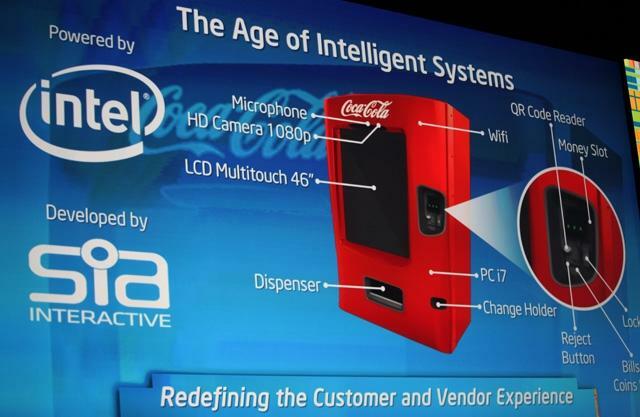 Intel unveiled these next-gen vending machines yesterday at Intel Developer Forum 2012 in San Francisco, which completely changes the way these machines formerly looked. No more bulky buttons that display the drink options — everything will now be within a 46-inch touchscreen via a gallery style interface. The new Coca-Cola machines also have a 1080p camera to snap pictures of the buyer so it can collect information about who is purchasing products from these vending machines and what they are buying. 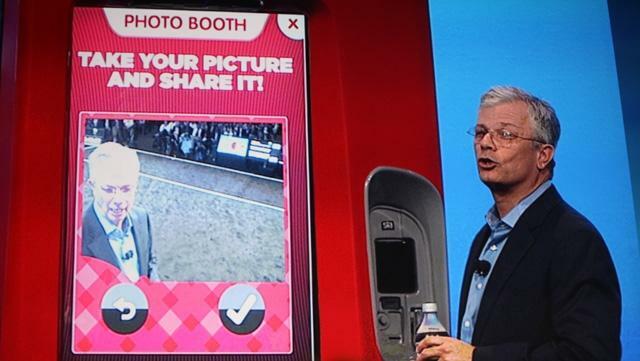 On the buyer’s side of interactivity, the built-in camera becomes a photo booth that allows customers to take pictures with their newly purchased product and send them off to friends. Can’t update anything these days without a social integration. In addition to these specs, the next-gen vending machines also sport Wi-Fi connectivity, QR code reader, microphone, NFC, and a money slot. The option for NFC is great for those who are embracing mobile payment applications, and the QR Code reader is useful for the coupon clippers coming to claim their free or discounted drinks. The integration of large screen display is not only great for video interactiveness but also turns the average vending machine into an advertising space. We’re not sure if Coca-Cola plans to do anything with the information collected from the machine (other than the demographics market research) but you can be on a lookout for these next-gen Coke machines in the near future. The machines have reportedly started popping up in eight countries across South America so they should make their way up north shortly.